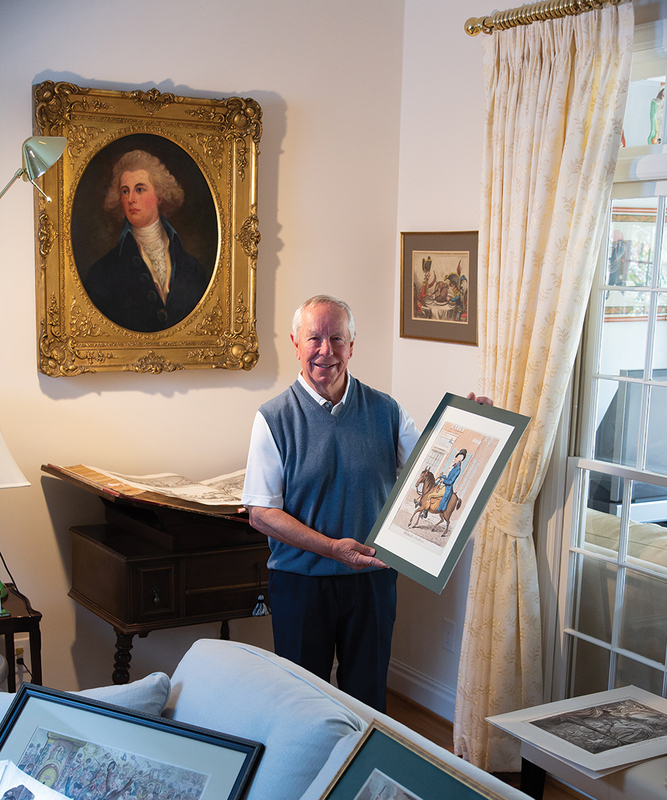 Tony Rothwell was 14 years old when he first encountered the work of British caricaturist James Gillray in the pages of a history textbook, and was captivated by the artistic talent and political depth of the work. “I didn’t realize how interested I was in the graphic arts, but I thought this was so wonderfully graphic and so clever, I made my own copy of it,” Rothwell says. Gillray is credited with creating and popularizing the political cartoon as a genre, and the influence of his work was felt throughout Europe. He directed his sharp wit at both political parties (depending on who was commissioning him), but Napoleon, in particular, was a focus of his derision. Rothwell has at least 150 Gillray prints and sketches. Although he has works by the caricaturist’s contemporaries as well, Rothwell is particularly impressed with Gillray’s political wit, breadth of knowledge and raw artistic talent. “Gillray really was the first true political caricaturist. He invented it,” Rothwell says. Gillray lived in a turbulent and exciting time, ripe for political discourse and caricature. Britain and France were competing for influence on the world stage. King George III and Napoleon Bonaparte lent themselves to the hyperbolized visual renderings that Gillray made so popular. It was also a time when the conventional methods of consuming news left something to be desired. Gillray saw an opportunity to put his artistic skills to commercial use, and opened a shop to sell his prints. Gillray’s influence extended to the upper reaches of the ruling political class. “He was being read by the House of Commons, by the royal family — people who had money and influence,” Rothwell says. There’s no true modern equivalent to Gillray’s prints. They resemble today’s political cartoons but are packed with subtle cultural symbols, allusions to Greek and Roman mythology and detailed historical context. Because Gillray’s well-heeled audience was also well educated, he was able to elevate his imagery and symbolism. 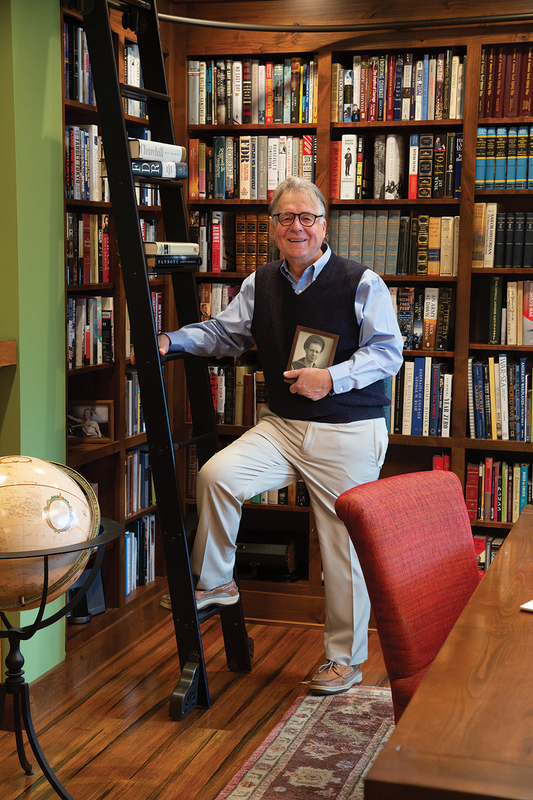 A self-described “pretty serious book collector,” Rick Smith has been afflicted with a passion for books since he was a child. “I fell in love with the tactile nature of books, how well they were bound and how colorful they were, the thickness and the weight,” Smith says. This childhood curiosity gradually developed into a full-blown obsession. Today Smith’s library contains around 1,200 books with hundreds of signed copies. Three books in the collection are autographed by former U.S. presidents: George W. Bush, George H.W. Bush and Harry Truman. Smith’s passion transformed his life in every respect, and his home is a testament to it. “My wife, Susie, said there’s room for two of us in this house but probably not for your books,’’ Smith says. He redesigned the garage of their lakeside cottage into a cozy personal library, complete with a rolling library ladder. A stained-glass lamp illuminates a massive worktable made from knotty alder wood. Smith’s father was a seaman first class on the aircraft carrier USS Bennington and the plane captain (crew chief) assigned to a one of the ship’s TBM Avengers — aircraft originally designed as torpedo bombers. His job was to ensure the bomber under his purview was combat ready. In 2003 James Bradley published his best-seller Flyboys. It details the harrowing 1942 air raid of Chichi Jima by TBM Avengers. Among the pilots was 19-year-old George H.W. Bush. Smith’s father felt a special connection to the former president through their shared experience with the TBM Avengers, so Smith bought a signed copy of Flyboys as a gift. Smith’s father brought the book to annual reunions for veterans who served on the USS Bennington, and began to collect signatures. “They would sign them with their rank at the time, the raids they were on, and when they served,” Smith says. “And one day when he was 79, he said to me: ‘One of the signatures that I’d really like to have in this book is the president’s signature.’ And I thought, good luck with that. Smith refined his search to World War II and its leaders. “I’m sort of focused, but in a lot of ways it’s about the chase,” he says. “So, it’s a passion for the subject matter; it’s a passion for the physical book; it’s a passion for the search and the chase.” And there’s comfort to be found in the written histories of great world leaders. Mitch Capel, the alter ego of Gran’daddy Junebug, has been an impactful presence in the Sandhills for decades. Capel’s unique delivery of stories and poems — some passed down through his family, others the recited works of his favorite poet, Paul Laurence Dunbar — has enabled him to touch the lives of countless young people. A Moore County native, Capel immersed himself in North Carolina’s artistic community throughout his storytelling career and formed close relationships with several influential artists native to the state. 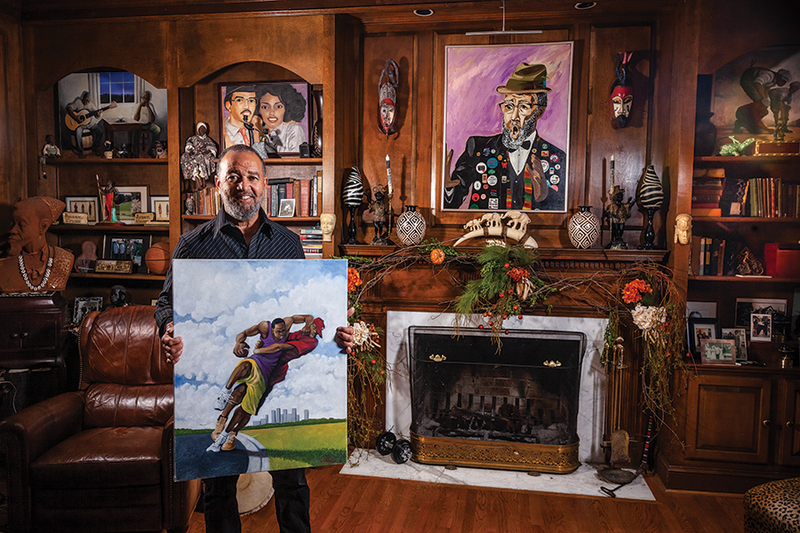 He and his wife, Pat, have created a collection of paintings featuring artists like Ernie Barnes, Bill Pinkney and Willie Nash. Capel is hard-pressed to pick a favorite. “They’re like children; I don’t know. If I had to pick one it’d be my wife’s work, of course. It’d be that one with the buttons,” Capel says, referring to a portrait hanging above the fireplace in his study. In it Capel is wearing his storytelling garb, an outfit smattered by colorful buttons he has collected over the years. Barnes attended North Carolina Central University, where he played football and majored in art. He played football professionally for five years before shifting his focus entirely to art. His 1970 painting The Sugar Shack was featured in the opening sequence of the Good Times television show, and was also used by Marvin Gaye as an album cover for his 1976 album, I Want You. Pinkney is another artist featured prominently in the Capels’ collection. He discovered Pinkney while performing at an alternative school in Fayetteville. After seeing his work hanging in the principal’s office, he knew he had to meet him. “I mean, he was so talented; what he did was amazing with the paintbrush, and it came so easy for him,” Capel says. Pinkney is best known for his painting of Julian Abele, the architect who designed Duke University’s Chapel. The work currently hangs in the University’s Gothic Reading Room. A Bill Pinkney piece titled Marbles is especially meaningful to Capel. “I had just unpacked this board game Mancala, and I’m on the floor and I’ve got these in my hand, and I flashed back to when I was a kid playing marbles. And the phone rings and it’s Bill: ‘Mitch, I just finished this painting, you’re gonna love it, it’s called Marbles.’ I dropped everything I was doing and went over there and I bought that piece,” Capel says. Gessner grew up in a small town in New York, influenced by his parents’ musical tastes. “Oh, yes, there was a large hi-fi, not a stereo, right outside my room. At night they would play Harry Belafonte, the big bands, Glenn Miller, all that kind of stuff. And it would kind of boom through the house,” he says. 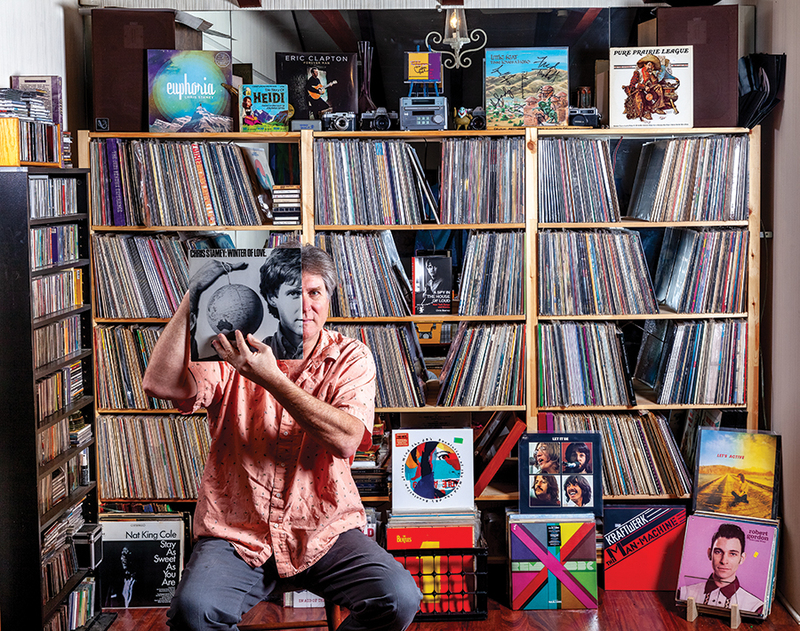 His collection has grown to an estimated 4,000 records, with about half on display in repurposed bookshelves in his living room. His musical interests created unique, career-altering opportunities. As a young photographer, Gessner shot album covers for many of the bands he listened to and saw in concert, and has kept in touch with many of them. Jane and Jim Lewis are not collectors. They are self-described “accumulators.” Although they did not personally acquire the 280 unique mini liquor bottles on display in their home, they have nevertheless taken on the role as stewards of the collection. The mini bottles were collected by Jane’s aunt, Billie Cave, who began collecting the bottles in the late 1930s. Knowing she was passionate about collecting mini bottles, Aunt Billie’s friends acquired many of the liquor bottles as souvenirs while traveling. 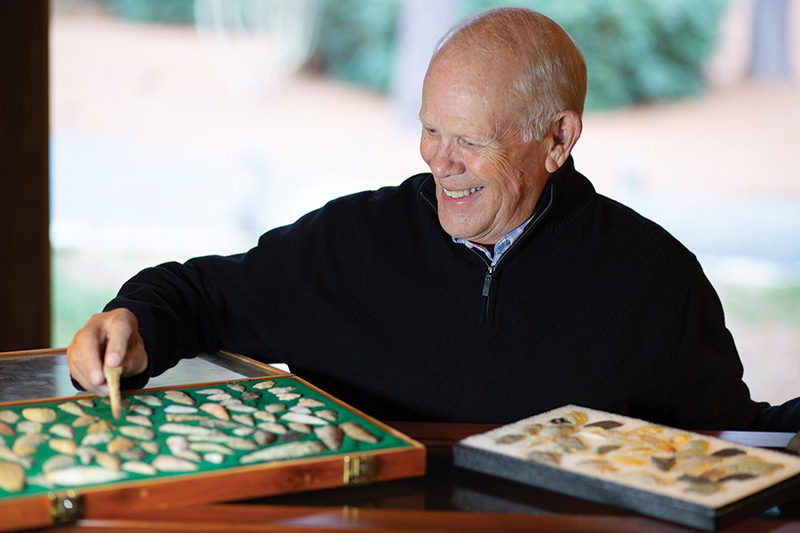 While Jane and Jim shy away from the term collector, they are clearly very fond of the collection. After nearly 40 years and after each of 14 address changes, the Lewises have always unpacked the bottles for display. 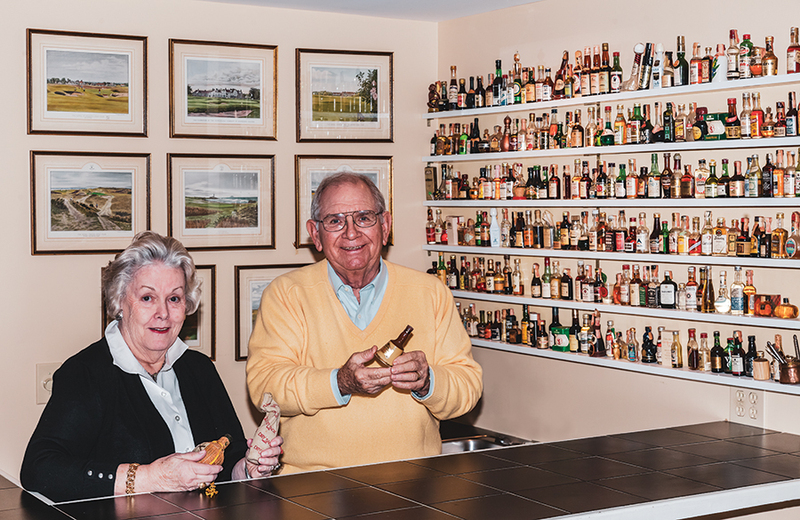 At their home in Pinehurst, the bottles sit on shallow shelves over a small built-in bar, a colorful centerpiece of the room, drawing the eye of visitors entering through a side door. The bottles come in every shape and size imaginable, and the faded neon mosaic framed by the white wall is a striking mainstay of their home’s décor. A glance will not do. 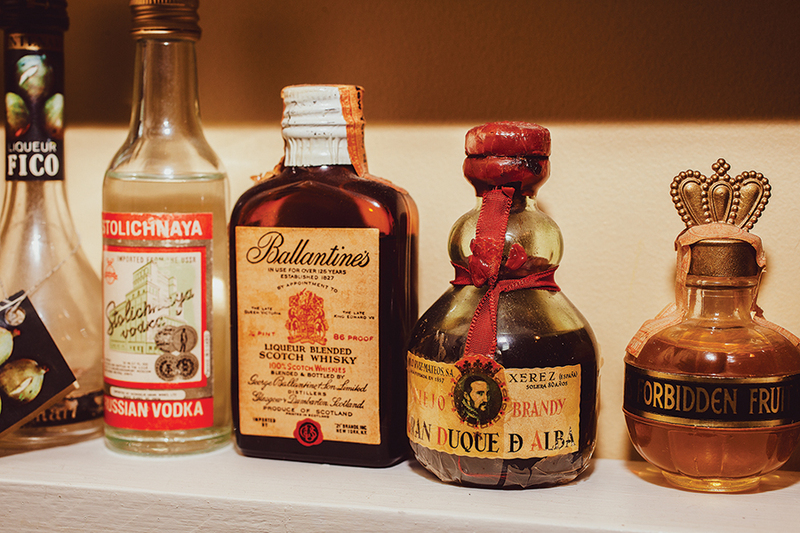 Some are easily recognizable as miniature versions of full-size liquor bottles. They tend to be more dignified and expensive Scotches, whiskeys and bourbons. Others are creative and delightfully original one-offs. Exotic liqueurs and rums seem to be the most outlandish, and the Portuguese Mobana Crème de Banana in the shape of a monkey is truly a work of art. The bottles are all unopened, although the contents of the oldest bottles have almost completely evaporated through the ancient but intact seals. Keeping the bottles in their unopened state was no easy task in a house with two young boys. As any parent whose liquor cabinet has been raided will understand, Jane and Jim told their sons a white lie to ensure the bottles remained sealed. The bottles have survived time, adolescent boys and a lifetime on the move. One day they’ll pass Aunt Billie’s bottles along to the next generation of stewards. Joe Vaughn began collecting Native American arrowheads as a child and has indulged his passion ever since. Vaughn is the middle child in a family of five boys, and his upbringing in Northampton County, North Carolina, afforded him endless opportunities to search for the elusive artifacts. 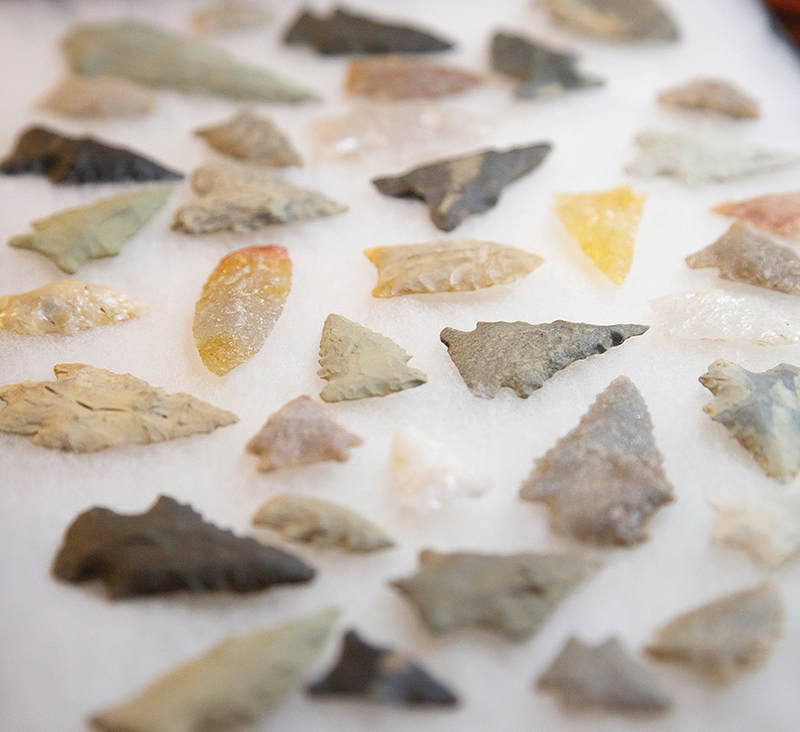 Over the years he’s found hundreds of perfectly intact arrowheads, all from the northeastern part of North Carolina. The best examples are still sharp to the touch. Vaughn considers the most impressive item in his collection to be a Clovis point, a longer spear point with a groove running down the middle. It is one of the oldest styles found in North Carolina and dates back to around 12,000 B.C. “It’s so rare to find these good ones, because there’s been so many plows and things stuck in the ground. It’s hard to find them anymore,” Vaughn says. The first step in finding fertile ground for hunting arrowheads is thinking about what the landscape provided thousands of years ago. Native Americans were more likely to settle in a spot near water, animals and edible vegetation, so sandy and loamy soil and moving water are good indicators. A fruitful field may have been recently plowed and then rained on. The plowing unearths buried artifacts and the rain washes away the final layer of dirt — a lucky combination made more difficult after modern farming techniques began planting seeds with a drill. Will Harris is serving an internship at PineStraw to complete his Business Journalism undergraduate degree from the University of North Carolina at Chapel Hill. He works locally as a carpenter, enjoys playing tennis, sailing and spending time with his dog Bear.